Dan Vannatta, Santa Clara Vanguard's general manager, sent this picture along. This photo was taken by Terry Maurer who volunteers for Santa Clara Vanguard and Blue Devils with fleet maintenance. His daughter Franny is a member of the Blue Devils Open Guard. On the corps' last excursion to San Bernardino for the Winter Guard International Regional, both groups traveled together in case one or the other ran into problems. 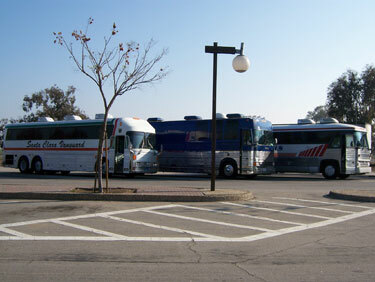 This is a picture of the two corps' buses parked together. Off the field, working together is the best way to make things happen and to ensure that safety comes first.